Of the $18.1 billion spent by companies on in-house research and development (R&D) in Canada in 2016, just under 9% ($1.6 billion) was directed toward energy-related technologies. R&D spending on fossil fuels, including the production and transportation of coal, oil and natural gas, has been decreasing since 2014. It now accounts for 43.0% ($699 million) of total in-house energy-related R&D spending in Canada. In-house energy-related R&D expenditures on fossil fuels continued to decrease, reflecting the impact of the 2015 downturn in oil prices. These expenditures fell from $1.3 billion in 2014 to $948 million in 2015, and then down to $699 million in 2016. In particular, in-house R&D expenditures on fossil fuels in the oil and gas extraction, contract drilling and related services industry decreased by almost 50%, falling from $1.1 billion in 2014 to $571 million in 2016. In 2016, R&D activities in the area of energy efficiency accounted for almost 20% of total in-house energy-related R&D expenditures. In-house R&D spending on energy efficiency technologies almost doubled, from $151 million in 2015 to $290 million in 2016. This trend was observed in almost all industries where energy efficiency technologies exist, particularly in the manufacturing sector. Spending by foreign-controlled firms on in-house energy-related R&D increased to $403 million in 2016, after declining from $432 million in 2014 to $324 million in 2015. These firms represented almost one-quarter of all energy-related in-house R&D expenditures, with over 30% of this segment dedicated to energy-efficiency technologies. Foreign-controlled firms dedicated approximately one-third of their energy-related R&D spending to fossil-fuel technologies in 2016, down from the three-quarters spent on this area of technology in 2014. 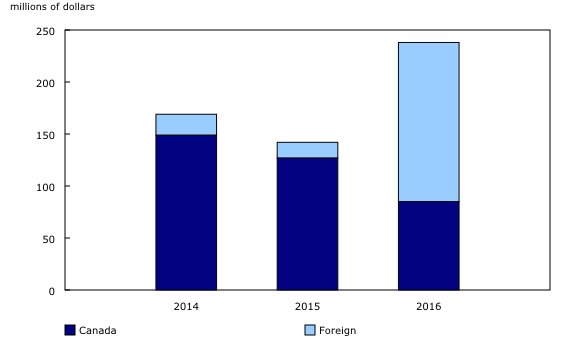 Additionally, spending by foreign-controlled firms on outsourced energy-related R&D grew from $15 million in 2015 to $153 million in 2016. These firms increased their spending tenfold, from $13 million in 2015 to $136 million within Canada in 2016. These firms represented almost two-thirds of all energy-related outsourced R&D expenditures. Energy-related technologies include: fossil fuels, renewable energy sources, nuclear fission and fusion, electric power, hydrogen and fuel cells, energy efficiency and other energy-related technologies. 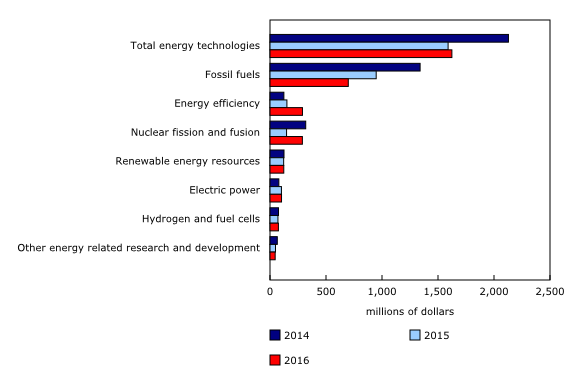 The Energy Research and Development Expenditures by Area of Technology survey data are collected by the Annual Survey of Research and Development in Canadian Industry.